It is not necessary to do business in a state to incorporate in that state; all you need is a registered agent with an in-state street address. Delaware is a popular state for incorporation because its state government is business-friendly and accessible. When you form a corporation, it automatically has C corporation status, meaning it is taxed under Subchapter C of the Internal Revenue Code. Although the IRS taxes the income of C corporations, the state of Delaware does not. The first step in forming a Delaware C corp is to choose a corporate name. The corporate name must not be in use by any other business organization in Delaware; it must also not violate any trademarks. It must include a designation such as Association, Club, Company, Corporation, Foundation, Fund, Incorporated, Institute, Limited, Society, Syndicate or Union, or abbreviations thereof, with or without punctuation. You can perform a free name availability search on the website of the Delaware Division of Corporations. Once you have selected your corporate name, you may reserve it online by paying a filing fee. The reservation is valid for 120 days and prevents anyone else from registering a Delaware business entity using the name you selected until the Delaware Secretary of State accepts your Certificate of Incorporation. A person, known as the incorporator, must prepare the Delaware Certificate of Incorporation, a one-page document that officially creates the corporation as soon as it is accepted for filing by the Delaware Secretary of State. The Certificate of Incorporation must include the corporation's legal name, the name of its registered agent, the street address of its registered office, the purpose of the corporation, the number of shares it is authorized to issue, the par value of the shares, which is the minimum price that a corporation can issue its shares to its initial founders, as well as the name and address of the incorporator. Corporate shareholders, directors and officers need not be identified in the Certificate. 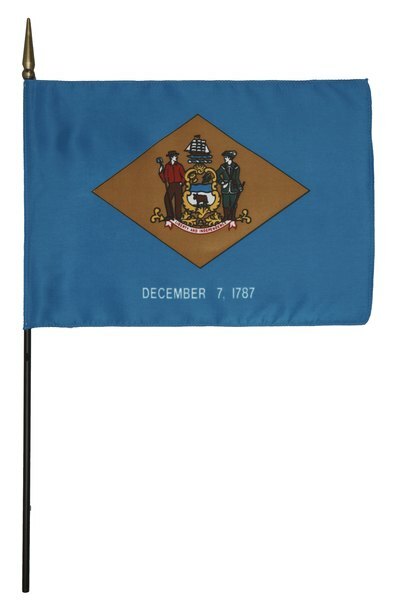 A template form of this document is available on the Delaware Secretary of State website. The incorporator must sign and date the Certificate of Incorporation; it must be submitted with the appropriate fee to the Delaware Secretary of State by mail, fax or hand delivery; you cannot submit it online. A Delaware corporation must establish its personnel. It must have at least one shareholder, one director, one registered agent and one officer secretary who can sign legal documents on behalf of the corporation and can record minutes of meetings. The director does not have to be a shareholder, but he must be a natural person, rather than business entity such as an LLC or a corporation. The registered agent does not have to be a shareholder, but must have a street address -- not a P.O. box -- in Delaware. The registered agent is the person responsible for receiving official communications for the corporation. A viable Delaware corporation must create a set of corporate bylaws that govern internal matters such as the appointment of directors and officers, the transfer of shares, voting rights, record keeping, the number of shareholders, the timing of meetings, the division of authority between shareholders and directors, the liability of directors and other important matters. The content of corporate bylaws are in some cases restricted by Delaware corporate law; for example, bylaws cannot authorize the board of directors to dissolve the corporation without shareholder approval. Bylaws do not have to be filed with any state or federal governmental entity.